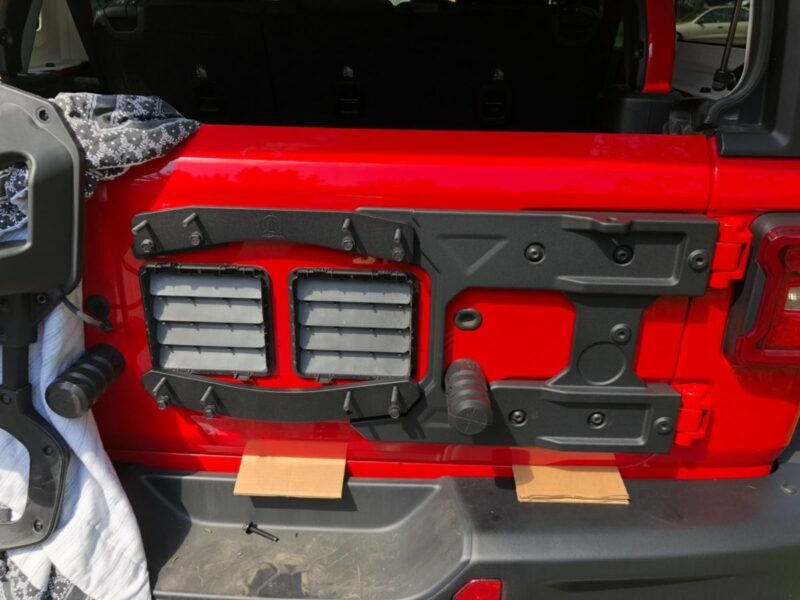 Back in September, I wrote about the MOPAR JL Tire Carrier Reinforcement and how it was performing with the factory wheel and 35-inch tires. Now that I have had aftermarket wheels and larger 37-inch tires on for awhile my opinions have changed on the setup. The full setup I am running is capable of handling a 37-inch wheel and tire combo. Just not every 37-inch combo. My current setup includes the Method Race Wheels MR-312 and Yokohama Tires X-MT. The current tire and wheel combo weighs 114 pounds before being inflated. Compare that to the previous tire and wheel combo at 90 pounds total, and that’s a big change. I have not been able to determine what the exact weight limit is. I know that the original setup was stone quiet, no weird tailgate noises, and the setup was ideal. Since the 37 was installed the tailgate sags when opened, there are thuds and thumps, and the tire is definitely less stable than it was. I did use the proper rubber stops and adjusted everything when the new tire was installed to compensate for the added weight. The factory hinges just don’t seem to be up to the task. At over $1000 the MOPAR JL Tire Reinforcement kit isn’t worth the money if you are going to go bigger than a 35-inch tire. Frankly, it isn’t worth the money for any reason. There are less expensive stronger alternatives available for far less money.